Dill is the son of a defrocked Pentecostal minister. Once upon a time, his father led services that involved handling poisonous snakes and drinking poison, but now he languishes in jail and only spits venom at Dill. Dill's friend Travis imagines himself as a character in a fantasy novel, carrying a long staff with him and pretending to be a wise warrior. In real life, Travis is dodging an abusive father and the ghost of dead older brother. In comparison, their mutual friend Lydia is a bright shining light. Intelligent and vivacious, she tries to prod her two friends to look to a better future. As for herself, she does well enough in school to have a shot at a good school and her popular fashion blog has gained her a nationwide following, which strains her friendship with the two boys. When a fatal tragedy strikes, the survivors have to find a way to pull themselves together and move on. A dreary story of dead-end dreams in rural Tennessee. But while the story is depressing, the characters are vivid and full-bodied, which makes the reading tolerable. 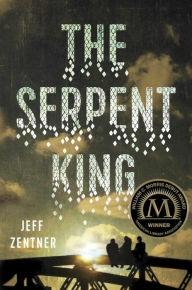 There is a huge contrast between Lydia's surreal success and the struggles of her friends, but it actually works in Zentner's hands as, no matter how well she does, it is clear that she is just one step out of the swamp.